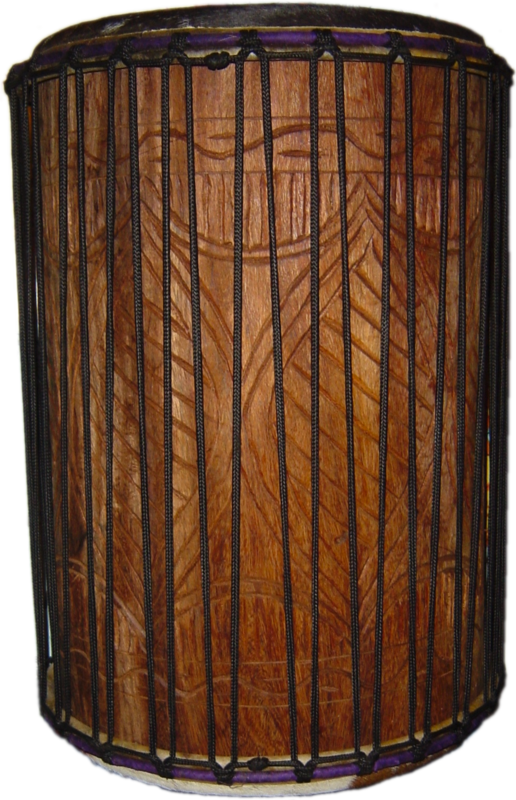 Our drum makers are artists whose decorative carvings are unique for each drum in the traditional spirit of the djembe, individualizing the drum for each player. Imported directly from Guinea, West Africa, via WULA Drums and from Ivory Coast and Mali, West Africa via Farafina Dambe, Holy Goat djembes are created by some of the same master drum makers who have created djembes for Africa’s top drum ensembles, including Les Ballets Africains and Ballet Djoliba. Since we have a close working relationship with them, we can work closely with you to match a drum to your individual style and preferences, including drums without any carvings at all. Also, knowing the artists who make our drums personally, we know their quality first-hand and can fully guarantee our djembes to be free of the hidden flaws and weaknesses that cost people down the line. And because we want you to have the ideal drum for you, we have established an open exchange policy. If you find true love in a new Holy Goat djembe after your original purchase, we will swap you the new drum for the old one as long it is still in good condition. Holy Goat Percussion sells drums via its online Drum Store, or by appointment from the studio in Oak Park, Illinois. If you live in the area, call Michael Taylor at (773) 909-8633, or email taylor@holygoat.com to arrange a time. A good djembe drum will not make you a good djembe player. However, your drumming experience will be enhanced (sound, feel, motivation) if you’re playing a good drum. Read below on how to get a good drum, or, go directly to the people who know — Holy Goat Percussion — to purchase your djembe with a 100% guarantee of quality and authenticity. To play traditional West African rhythms, get a traditional drum…a drum made of goatskin, carved from a real tree and handcrafted by traditional West African artists. The shell should be of solid wood, but it doesn’t have to weigh a ton. A heavy shell does not necessarily lead to a fat sound. What you want to look for is solidity: watch out for thin shells or light wood that may crack more easily and necessitate costly repairs. The best way to test the solidity of a drum is to hold it up and hit a bass note at the center of the head. A good drum has a long bass tone with deep resonance. The skin of the drum should be smooth and tight, dry but not brittle. Your hand should bend comfortably over the rim; you don’t want to feel a sharp edge under the skin. Djembes vary in sound based on subtle differences in the drum: the thickness of the skin, the width of the rim, the length and narrowness of the stem. It’s best to try the drum before you buy it since people vary too. Differences like the size of your hands, the length of your arms, and your height will affect how a drum suits your style. Since you should expect to pay $300-$700 for a drum of high quality, be selective. Make sure your drum is compatible with you. The best players choose a drum like a true love, with care and patience. You will enjoy a long happy relationship with a well-crafted West African djembe as long as you take proper care of it. Holy Goat recommends purchasing a case for your drum. It will add another $80-$100 to the cost of your purchase, but a good case is like drum insurance. It protects your investment. For djembe bags and such, I usually carry nice mudcloth bags, but if I’m out or if you’d like a larger selection, I would recommend The Old Town School of Folk Music or Andy’s Music (both in Chicago). Keep in mind that repairs can cost as much or more than the original price of your drum. You want something to buffer the shell and protect the skin from rain and snow. Levys makes a great djembe cover. You can get one through Chicago’s Different Strummer music store at the Old Town School of Folk Music, 773-728-6000. Don’t drop, bounce, or bang your drum around like a toy. It’s not a toy. Don’t play it in the rain. Never use lotion, oil, or lubricant of any kind on the skin. Also, avoid playing the drum after using lotion or oils on your hands. Remove all rings, watches, or other jewelry from your hands before playing. Avoid over-tightening drum snaps; you might break the head. If you baggage-check your drum when flying make sure it’s well padded. If you suspect something is wrong with your drum, take it to an expert for a check-up. Never try to “fix” your drum yourself without guidance from an expert. 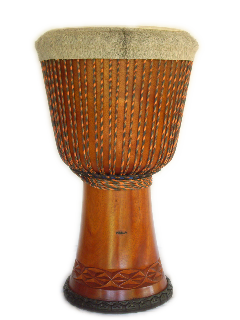 Fortunately, if you are located near Oak Park, Illinois, you can eliminate the problem of finding and affording a worthy djembe expert every time your drum needs tuning. Taylor’s Djembe Repair/Maintenance Workshop is held at the Holy Goat Percussion studio. You can come and hang with me and help me do drum repair work. You’ll learn hands-on by working either on your own drum or one of ours. Email Taylor, if you’re interested in this. If you’re not one of those lucky people living near Oak Park, Illinois, you can send your burning questions about your drum’s care to taylor@holygoat.com. But first, read these Frequently Asked Questions where your answers may already be revealed. Final Note: Djembe drums can look good on the outside but have hidden flaws that create big problems for you later on. Be careful of “sweet deals.” Know your drum vendor and know if your drum vendor knows his drum makers and stands by their work. If you are in doubt of a drum’s quality for any reason, don’t buy it. It will only cost you. With a Holy Goat drum, of course, you have nothing to fear. We stand by our djembes 100% and guarantee your drum will have the best, most authentic sound.